Cool habits to stay fit. This is the basic and the starting yogic exercise. "Tada" refers to a mountain. This refers to stand like a mountain. This is nothing but to know the correct standing position. 1. Stand firmly and keep both the feet together. The knees should be straight and keep the hands tight and firm. Concentrate on a particular object and keep the mind calm and relaxed. 2. Lift the hands slowly and perform Namaskar (Salute). The head and chest should be firm and straight. 3. Start inhalation deeply, and lift the heels slowly. Stay for few seconds and then exhale slowly and keep down the heel to the normal position and relax for few seconds. 4. Visualization is an effective tool for the mountain pose. As you hold this pose, imagine you are a mountain. Feel how steady, strong, solid, balanced you are. Feel how you are both a unique, powerful manifestation, and at the same time no different from the planet you rise out of. 5. Practice this exercise for 2 or 3 times. 1. 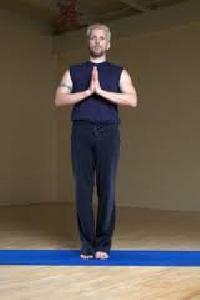 This yogic exercise helps to give the complete knowledge of perfect standing position. 2. Helps to give control over muscular movement. 3. In this yogic practice the entire body weight lies on the heel or on the edge of the feet. It gives enough strength to legs and feet. It also stimulates the entire nervous system of the body. When holding the mountain pose, be careful to stay balanced. If you stand off-balance, your spine�s elasticity and alignment will be compromised. Also, tilt your hips slightly in, which will naturally tilt your stomach back toward your spine. The heels on our shoes (even on our gym shoes!) constantly push our hips back and our stomachs out. Realign them with tadasana.